Here’s the first guide in a series of gift guides this holiday season! Right now, I am in such cozy mode that I am craving all the cozy things! Give me all the soft sweaters, slipper socks, scarves… You name it, I want it! 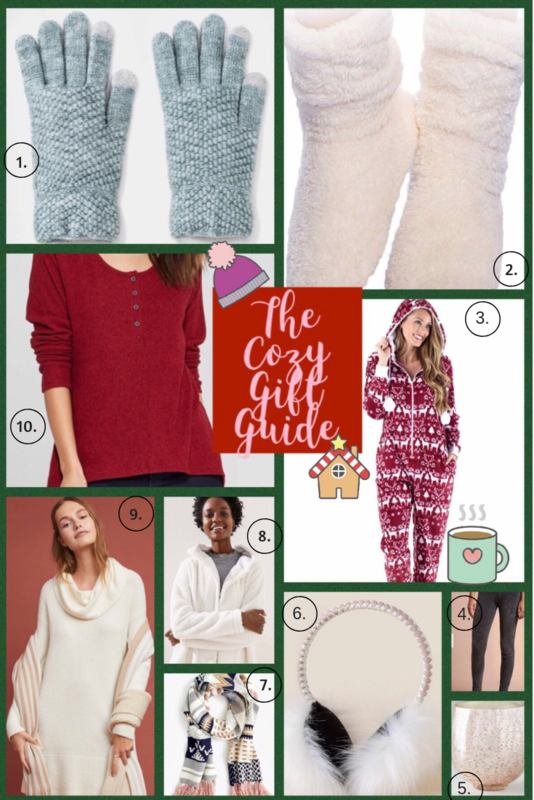 I’m sharing reasonably-priced cozy gifts from my favorite retailers! I plan on curating guides specific to many different kinds of recipients. Please leave a comment on this post with a guide you would find useful, and I’ll get on it right away! Knit Tech Gloves ($9.99, come in 4 colors) Everyone could use a pair of these! Who wants frozen fingers when handling their phone at a tailgate party or at a holiday parade with the family?! Velvet Slipper Socks ($10, come in 3 colors) Happy feet. ‘Nuff said. Fleece Onesie Pajamas (about $35, come in 6 variations and have pom pom drawstrings!) I have never had onesie pajamas, and I am a sucker for the red holiday print! These jammies are footless, which I love because I’m tall. When I was a kid, the onesies pajamas with footies were always stretched to the max on me. I hated it! It was either that, or they were 2 sizes to big to accommodate length! Chenille Leggings ($58, come in 3 colors) These are sooo soft. I want to LIVE in them. Crackled Glass Candle in Mulled Wine ($34) I just bought this cozy candle yesterday. At first, I was drawn to the pretty presentation, but once I took a whiff, I was a goner! Smells sooo good! Faux Fur Ear Muff ($24, come in 3 colors) Faux fur anything is always so cute, and I love that these ear muffs look like a headband! Patchwork Fair Isle Knit Scarf ($79.50, but 25% off right now with code READYTOPARTY, comes in 2 colors) How charming are the colors and the fringe? Bonus: Scarves fit everyone! Faux Sherpa Open Hoodie ($79.50) This cozy number has a shirttail hem and side slit pockets. It’s an amped up version of your standard cardigan! Sweater Dress (on sale for $98 for a limited time, comes in 4 colors) Throw this on and look chic but feel like you’re in pajamas. It’s perfect for days when you’re not sure if friends and family are stopping by your house. Long Sleeve Cozy Henley ($24.99, comes in 3 colors) This is not your average henley! It has a relaxed fit and isn’t as form-fitting as others. Where are my large-busted girls?! This one won’t make you feel like you’re on display! Take a closer look! I’ve included a few surprise cozy gifts that I didn’t mention above. Don’t forget to follow me on the LIKEtoKNOW.it app for access to exclusive content. Here are my most recent shoppable photos. Click a photo to learn more! This is a great guide to finding home-y, Christmas gifts. I know lots of people who would love blankets, scarves, or candles. Perfect for the season! Great guide. I see a number of things I want for me as well as some for gifts. There is something there for everyone on my list! OK. I am totally getting those slipper socks. They are on the top of my wish list!